As we go through this post together, I want you to think about a specific goal that you are currently working on for yourself. Are you looking to lose weight? Clean up your diet a bit? Reduce soda/sugar consumption? Maybe it has nothing to do with diet whatsoever! That’s OK, too! Whatever you have set out for yourself, write it down on a piece of paper next to you. Our life is made up of habits. What we eat, where we go, when we exercise, if we exercise, where we shop, and so forth. While we may change up a few things here and there, for the most part, our days are a cumulation of habits. This principle is exactly what weight loss is all about. 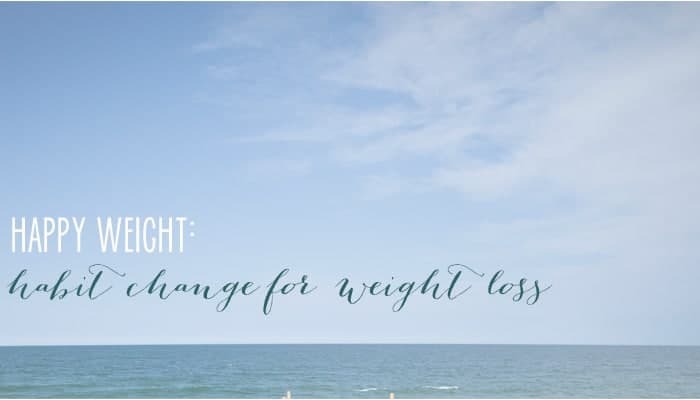 I’m using the example of weight loss because it’s what 90% of my clients want, but I want you to focus on whatever goal you wrote down for yourself earlier. When I work with a client on weight loss, my first step is assessing current habits and then asking the BIG question: where are you holding yourself back? Most of us know what habits are contributing to our goals not being met. It’s not always obvious, but once we do a little digging, they are right there on the surface for us to see. Maybe we reach for dessert after a long day of work. Maybe we don’t head to the gym when work gets too busy. Maybe we do well with breakfast and lunch, but default to fast food for dinner because it’s “easier”. No judgements, but we can’t start with actually changing your “life” until we determine what habits got us to where we are now. Identify those and the process gets much easier. Weight loss, like many goals, can be incredibly daunting. Especially if our goal is >10 pounds, the steps to get there can be overwhelming enough to make you want to throw in the towel. Tempted to give it all up over a “bad” day, instead of continuing to push through to what you want. I get that. I understand how scary big, life-changing goals can be. Now to the goal that you wrote down. I want you now to think of 2-3 habits that are keeping you from reaching it. This might take a little soul searching or conferring with a loved one, but it’s important to identify the habits. Remember, we can’t change our life until we change our habits. Now, pick 1. Yup, just 1. Start there. Work just on changing that habit. When you are finished, move onto the next one. Sooner, later, however long it takes to kick the habits, you will eventually see tangible improvements in your life- one habit at a time. Finally, a last word on habits. The old thinking used to be that if you did something for “21 days” ta-da! it would magically become a habit. New research shows that habits change based on the feeling you get while doing it! For example, I know that I tend to snack (especially on chocolate!) when I am overwhelmed. I learned this while trying to examine my own habits and after keeping a food journal for a few days. Open emails —> feel overwhelmed —> reach for chocolate. I wasn’t hungry, I just wanted something to munch on while my brain processed my to-do list. Now, when I feel overwhelmed, I’ve been working on taking 10 deep belly breaths. This helps me focus on the tasks ahead of me- exactly the same feeling I used to get from snacking. Changing that habit probably wouldn’t have worked if I told myself “don’t eat chocolate”. Maybe for a few days, but not for the long term. I had to change the why along with the habit. What habits are you working on? Do you agree with changing one habit at a time to reach your goal? I LOVE this post! I have a few of areas in my life right now where I working on making some big changes and this post is exactly what I needed to read. I’ve been feeling overwhelmed lately and think your idea of breaking things down into smaller habits will be helpful for me. Thanks for sharing! Yay! that MAKES my day! I am so happy that you enjoyed it! I love when posts “speak” to me 🙂 Good luck with your goals! I love this post! I’m currently trying to instill a few new healthy habits into my life, and breaking them down into smaller bits definitely helps! Looking forward to reading the rest of the posts in this series! Great post. Totally agree that if you break down bigger goals into smaller more manageable goals it is far less intimidating. This past year I’ve really reduced processed foods and make a ton more of my own foods. My goal wasn’t weight related just want to continually improve my health. I love that goal! And yes, this approach works for everything- not just weight loss! I tend to feel really overwhelmed with larger goals/intentions I set for myself. I break them into habits that got me there and it’s sooo much easier! So true! 21 days doesn’t make it a habit or make it stick. I just finished my Sugar Free September challenge and I know that I could easily go back to tons of added sugar in my diet. The no sugar added didn’t become a habit if I want it to stick I have to continue making the right choices! We are what we do 90% of the time. I love this! As someone who has lost a lost of weight, I love articles that talk about maintaining a healthy weight. Mindless snacking while working and studying is a big habit I’ve been working on! Awesome! That’s such a huge one! Next month I’ll be chatting about mindfulness for weight loss/maintenance- there is a huge connection! Thanks for stopping by!